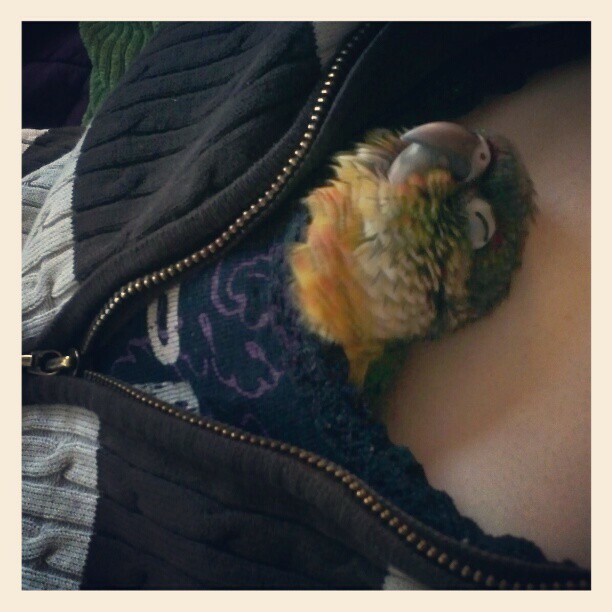 Conures have notorious personalities, and Ender was no exception. He had to be with me all of the time, constantly exploring whatever it was I was doing or cuddling on me or actively engaging in his surroundings. He was pretty quiet, especially compared to my Quakers, but he loved to make odd little noises and laugh at me. The only word I ever heard him say was “baby”. He loved being petted and cuddled. He loved meeting new people, he loved having his neck scratched and his tummy rubbed. He even liked being upside-down. He ate everything I ate. Apples and peanut butter sandwiches, eggs and popcorn and pasta. He liked to come wake me up when I had the audacity to take naps when I could be playing with him instead. He and the Quakers became reasonably respectful of each other, though Petrie was certainly not fond of this new precocious child who wanted to eat *his* food and play with *his* toys and love on *his* Mama. Little bugger loved to fall asleep in the middle of my bed. And in my shirt. And everywhere. He was wicked comfortable anywhere. Seriously. In December I made my very first post on Reddit. It was of Ender, asleep in my cleavage. Ender got upvoted to the front page. He got 1,693 points on Reddit. The image was viewed 211,000 times. The past few months, he’d begun puberty, which was leading to new and hilarious behaviors with the occasional obnoxious moody nip. I was looking forward to a long life with this little bird. I returned to Las Vegas from my holidays in Boston and picked the birds up on Thursday, January 3rd from their caretaker. Everybody was happy to be home, and we spent hours together before I realized I needed to sleep. Ender used to sleep in my room all the time. I’d put his cage beside my bed and lay down with him until he started to fall asleep. Then I’d put him inside his cage and I’d go to sleep. I loved having him near me. He loved being near me. So, I put the Quakers in their room, and brought Ender into mine. He fell asleep after a while, and I placed him in his cage and closed it. I took some NyQuil and fell asleep. I woke up several hours later to find his limp, little body beside me in the bed. He had died some indeterminate amount of time earlier. I have no idea if I’d crushed him, if he smothered in the blankets, if he had a heart attack – I have no idea what happened. I don’t know if I latched his cage shut or just closed it. I don’t know if he came to cuddle or came in distress. I don’t know if he made a sound. I don’t know if I did it. I just know I woke up and my baby birdie was dead. I still haven’t buried him. His little body is in a box in my freezer until I decide what to do. It’s been four days. I’ve had to work, I’ve had to go about my business out in the world pretending everything’s okay, when on Facebook I’m posting pictures and poems and songs and mourning the loss of my little guy. Every time I close my eyes, I see his fragile little body against the blankets. I see the way I moved them, and the way he lay. I remember the feeling of his feathers against my fingers as I held his body against my ear, hoping against hope for a heartbeat. I keep wondering what he felt when he went, if he was scared, my mind keeps thinking human concepts like “did he feel betrayed, if I did it? If I crushed him?”. These thoughts and images come less today than they did yesterday, and less yesterday than before. But they haunt me. I sat with him in my hands for an hour after finding him, just petting his lifeless little form, hoping he’d wake up or that I’d wake up and find it was a terrible nightmare. I’d had him 7 and a half months. He wasn’t even a year old. I keep feeling negligent and responsible for his death, despite the fact that my friends and loved ones assure me that it was an accident and it doesn’t make me a bad bird-mother. I just keep seeing him when I close my eyes, and I keep knowing I’ll never touch his feathers again, or feel him climb up my hair or nuzzling my neck. He deserved a story while he was alive. He should’ve had a long life. He was my baby birdie, and he’s gone now. My heart breaks, I have this incredibly endless supply of tears, and I’m holding my other birds closely, wondering if I can survive a feeling worse than this one when someday they die too. I whisper things to Petrie like “promise me you’ll live forever”. I’ll be okay with time. I’m just hurting for a little bird I loved for far too short a time. Previous PostThe Place in My Heart for San FranciscoNext PostThree. Oh, dear girl, my heart breaks for you. And I don’t feel any difference in your loss of Ender than I do in losing RacerX. It’s all pain. I wish I had solace for you. All I can offer is my love nd compassion and a place to hibernate if you wish. I love you and I m grateful to you for my Justice. I don’t think I would have had the courage to bring him home if I didn’t know you.